1	Preheat the oven to 180°C, gas mark 4. Place a large, deep ovenproof casserole with a tight- fitting lid over a medium heat. Add 3 tbsp of olive oil and 2 of the finely chopped onions. Fry for 5 minutes or until they begin to colour. 2	Stir in 4 finely chopped garlic cloves and fry for 20 seconds. Pour in both cans of plum tomatoes. Break up the tomatoes with a spatula and season with coarse sea salt. Fill one of the tomato cans with water and add this to the pan. Simmer over a medium heat for 10 minutes and then turn off the heat. Add 200ml water and remove half the sauce and set aside. 3	Place a large frying pan over a medium heat, add 2 tbsp of oil and the remaining chopped onion. Fry for 5 minutes, until the onion begins to colour. Add the remaining garlic and fry for another 20 seconds. Add the minced veal and pork, breaking them up with a spatula and fry for 10 minutes until the meat just turns brown. Season generously. Stir in the basmati rice and turn off the heat. 4	Carefully cut out the stalk from each whole pepper and remove all the seeds. 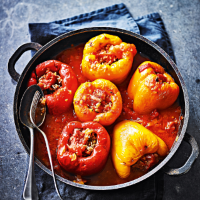 Stuff each pepper with the cooked mince and rice mixture – fill loosely so the rice can expand as it cooks. Arrange the peppers in the casserole pot, pushing them into the sauce. Pour the reserved tomato sauce over the top. Drizzle with the remaining oil, cover and bake for 1 hour. Check the sauce and add a little extra water if the sauce is too thick. Cover again and cook for a further 30 minutes, until the peppers are soft and the rice is tender. Serve split open with tomato sauce spooned over. Delicious with a dressed green salad.